NEMO 1-D computes current flow in 1-D heterostructures where typically a double integral over momentum and energy is solved for many different bais points. The theory is based on the non-equilibriu Green function formalism. 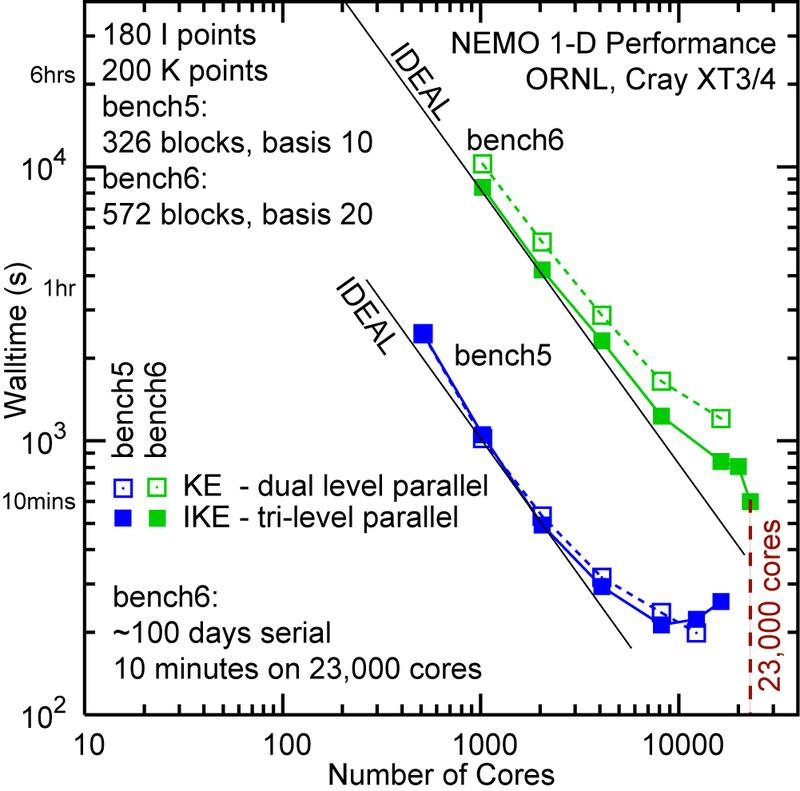 NEMO 1-D has been demonstrated to scale up to 23,000 processors in July of 2007 on ORNL's Cray XT3/4. Scaling experiments on various other TOP500 machines have also been performed. NEMO 3-D computes electrnic structure in multi-million atom systems. The basic operation is the solution of an interior eigenvalue problem and requires a large number of sparse-matrix vector multiplies. 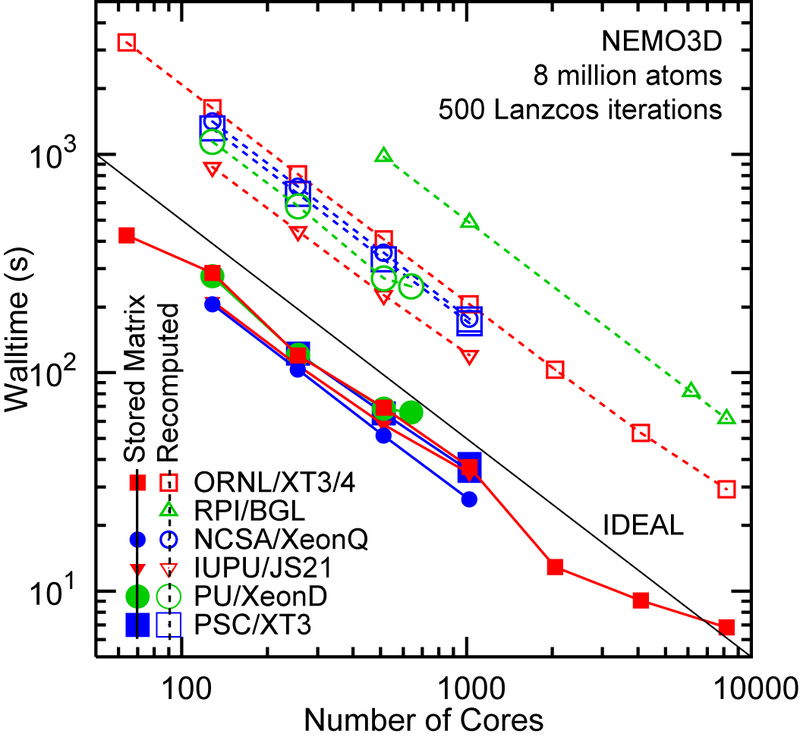 NEMO 3-D has been demonstrated to scale to 8,192 cores in July of 2007 on various TOP500 machines. Details of the various scalings on these machines are available. Parallelization work of NEMO 1-D began 1998 at the Jet Propulsion laboratory with compiler based parallelization and continued with tri-level MPI-based parallelization . NEMO 3-D was immediately designed as a parallel code. Several other benchmarks stemming from the early JPL work are also available. 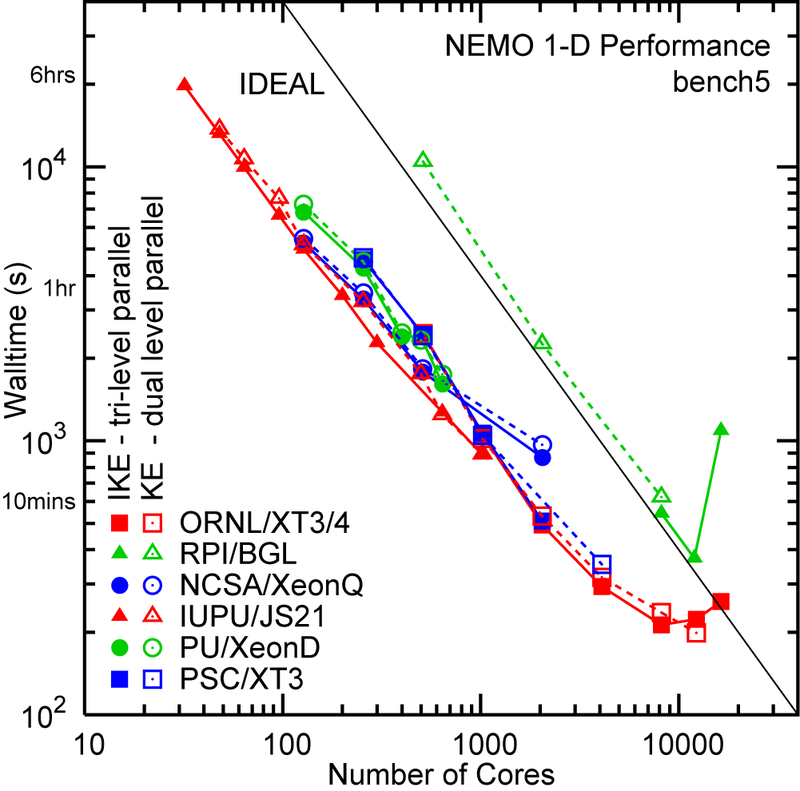 Compiler-based parallelization and benchmarking of the original NEMO-1D code. 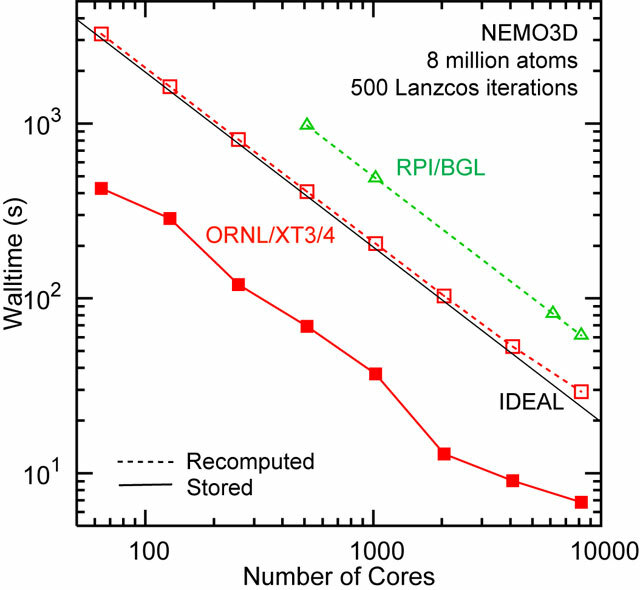 MPI-based parallelization of the original NEMO-1D code in loops corresponding to bias points, and integrations of the transverse momentum and energy. Benchmarks comparing a 32 CPU Beowulf (450MHz) to a 20 node dual CPU Beowulf (800MHz). MPI-based parallel genetic algorithm package usage and code developmend (GENES). Strong scaling of a constant problem size (8 million atoms) on 2 different HPC platforms. Solid / dashed lines correspond to a stored / recomputed Hamiltonian matrix. The largest number of cores available were 8,192 on Cray XT3/4 and IBM B/G. Strong scaling of a constant problem size (8 million atoms) on 6 different HPC platforms. Solid / dashed lines correspond to a stored / recomputed Hamiltonian matrix. The largest number of cores available were 8,192 on Cray XT3/4 and IBM B/G.